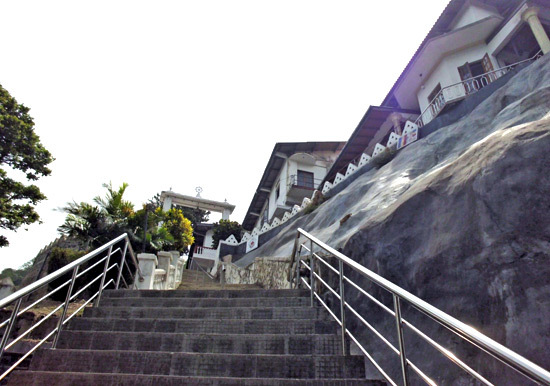 In close proximity to the Temple of the Sacred Tooth Relic, perched on the foothills of the famous Udawatta Kele sanctuary, is a temple encircled by a charming cloud wall. Overlooking the scenic cityscapes of the beautiful Kandy city, this temple has silently served the nation for 66 years with the invaluable Dhamma, and still continues to do so. During the Buddha's era, the two chief disciples of the Bhikkhu Order were Sariputta and Moggallana. Likewise, in the Order of Bhikkhunis, Khema was the first and the wisest disciple and Uppalavanna, was the second chief disciple Bhikkhuni who had great psychic powers. Travelling along the A6 route towards Dambulla from Kurunegala, eight kilometres off Ibbagamuwa is the village of Polgolla. To the right of the road, a massive and magnificent Buddha Statue can be sighted, indicating to the passers by, the location of the ancient Pingalpoththa Raja Maha Vihara.